A very choppy week until the last two hours of Friday’s trading session where all four indices synched up to close on the highs for the week – something we haven’t seen in some time. This is a strong technical signal that the uptrend from the 2/9 low will continue into next week, further implying an all-clear from the 10% drop we experienced earlier this month. Readings from the options market showed there was too much pessimism among investors leading into Friday. Consequently, these put buyers (betting on a market fall) got burned badly as the week closed and will likely reverse their bets next week – this should induce more buying on Monday. Large institutions and other players will likely realize there is more to go on the bull market and capitulate and begin to buy stocks. The price action early next week will be telling so we can likely confirm a bottom if the equity markets are strong next week. How did this all start? A spike in the yield curve was the culprit that cooled its engines this week. 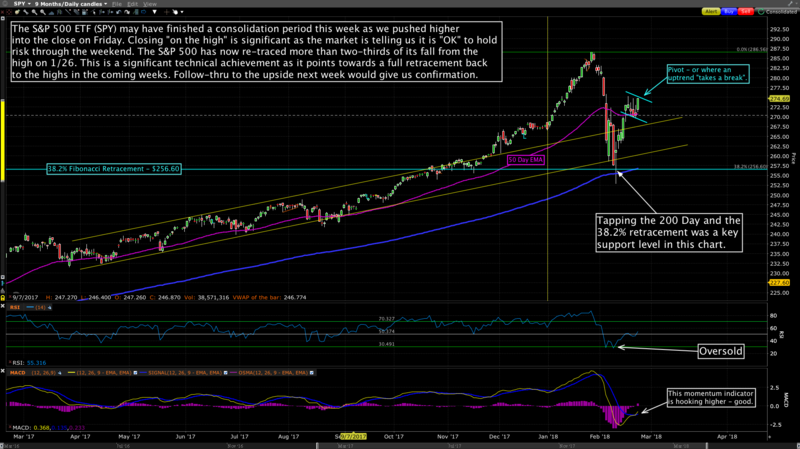 Let’s review the long term chart to gain some perspective. 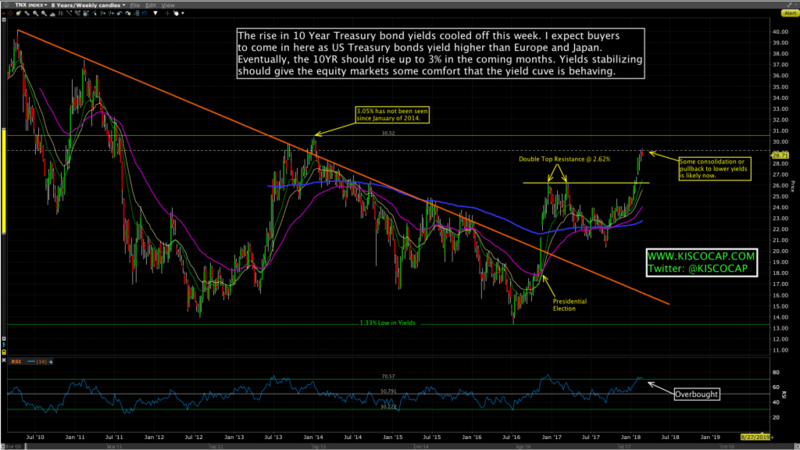 The next section should give some perspective on global interest rates and why the 10 year yield will likely stabilize in the coming weeks. Hopefully, I’ll name next week’s post, “All-Clear!”. This chart shows U.S. 10 year Treasury bond yields verses other sovereign countries. 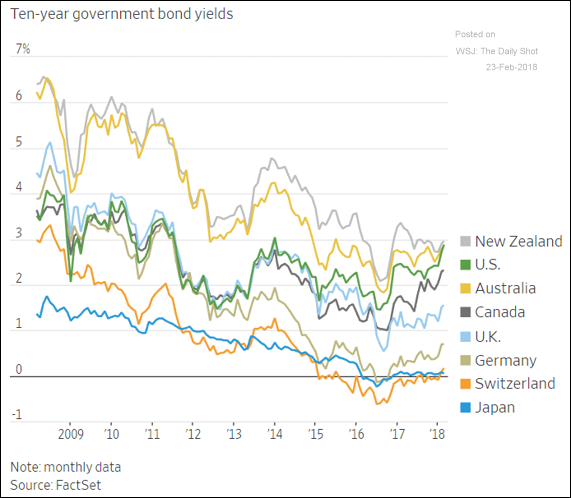 Most of the developed world yields significantly lower which implies that the U.S. Treasury bond is “cheap” in comparison to other sovereign bonds. This relative value proposition should cap how much higher U.S. yields will climb despite the worrisome gyrations in the equity markets this month. Sales of previously owned homes in the US unexpectedly fell by the most in nearly two years, sliding for the second consecutive month. Existing home sales fell 3.2% in January which was the steepest one-month drop since February 2016, according to Thomson Reuters data. Next Week: New Home Sales, Durable Goods, Consumer Confidence, Personal Income, ISM (Manufacturing Index), Motor Vehicle Sales and Construction Spending. The world’s largest oil exporter, Saudi Arabia, is exploring the use of nuclear energy for domestic energy consumption as part of its transition away from an oil-based system. “We are looking at a number of countries that have nuclear technology for peaceful purposes… so that we can save the oil and export it in order to generate revenue,” Foreign Minister Adel Al-Jubeir said at the Munich Security Conference. General Motors has offered to convert debt of around $2.2B owed by its ailing South Korean operation into equity in exchange for financial support and tax benefits from Seoul, Reuters reports. GM also plans to produce two new models in South Korea after announcing last week it would shutter one facility and soon decide the future of the remaining three plants in the country. Apple is in talks to buy long-term supplies of cobalt directly from miners for the first time, seeking to procure “several thousand” metric tons of cobalt per year for a period of at least five years, Bloomberg reports. The strategy is designed to buffer Apple’s reserves of the key lithium ion battery ingredient amid industry fears of a shortage driven by the electric vehicle boom. Royal Bank of Scotland has ended a nine-year streak of losses in a milestone hailed by chief executive Ross McEwan as a “symbolic moment”, but celebrations were tempered by the bank’s failure to settle a long-running US legal case. The chairman of Chinese car maker Zhejiang Geely Holding Group has accumulated a 9.7% stake in German car-and-truck giant Daimler — worth about $9 billion at current market prices. The investment wasn’t made directly by the company but instead was made on behalf of Chairman Li Shufu, according to a filing. Web-storage company Dropbox Inc. raised the curtain Friday on its long-awaited initial public offering, which is set to be one of the biggest tech debuts of the past few years. The 11-year-old company’s financials paint a picture of a firm with more than $1 billion in revenue, shrinking losses and roughly 11 million paying users. Still, revenue growth has slowed and the vast majority of its more than 500 million users don’t pay. The Chinese government has seized control of Anbang Insurance Group and said its chairman had been prosecuted, in a striking move that highlights Beijing’s willingness to crack down on financial risk and curtail debt-laden conglomerates. Anbang is said to have violated laws and regulations that “may seriously endanger the solvency of the company,” following acquisitions including the Waldorf Astoria and insurers in Europe and Asia.